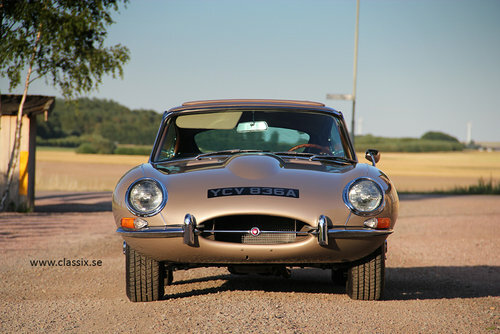 The Jaguar E-type series 1 is considered by many to be One of the most beautiful cars in the world. And to me the coupe is the best as it completes the lines better than a convertible. 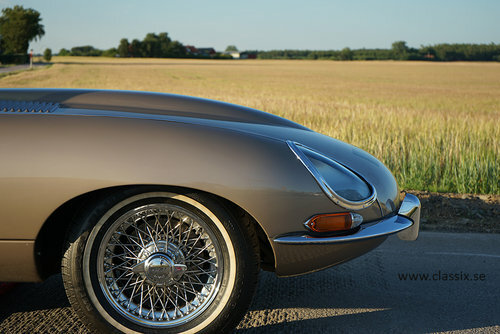 Exterior: The opalescent golden sand colour looks stunning on the Jaguar XKE! The paintwork on this car is perfect, the panel gaps are perfect, the balance of the car is of course also perfect. 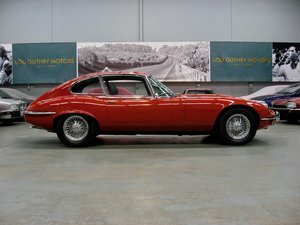 This is a car that gets an incredible amount of road presence, not only because it is a Jaguar E-type, but for the reason it is such a beautiful car in this colour configuration. The brown leather bucket seats so visible through the clear glass are like a dessert topped off with the finest chocolate dust. Chrome spoke wire wheels, bumpers etc also in excellent condition. 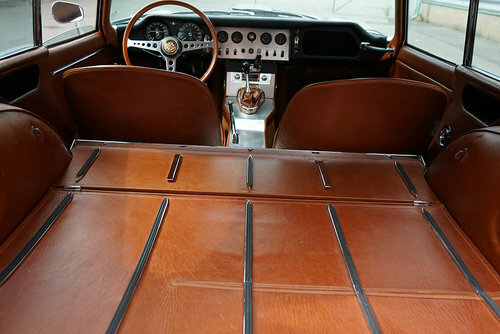 Interior: That brown leather really makes a lovely contrast with all this chrome details you have in the early Series One cars. Some details have received a small upgrade, such as having the brown carpet come up on the sides where you step into the car. Also, the rear compartment is done in the same brown leather and this gives the not only a more luxurious look, but also a very nice smell when you open the door. 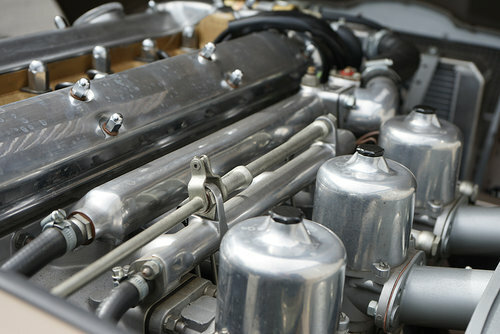 Engine: The 3,8l unit gives the E-types the best sound. It feels sportier and revs more freely. The engine and gearbox of this car was completely stripped down and build up again with new parts. This was done in 2012 and it has not travelled far since. There are detailed invoices of all the mechanical work that has been done to this car. If you are a buyer just send me an e-mail and I can send you copies. The car runs perfect today and just complete a 300km journey in one stretch. History: This car was sold new to Jerry W More in Wawona California on the 19th of November 1963. It was then sold in 2010 to Mr Bracht in Australia and from there to a dealer in U.K and then found its way to Sweden in January 2017. It comes with a Heritage certificate and is a matching numbers car. Most of the work on this car was done in 2012 and it has been exercised only on sunny days since. It is still to today in impeccable condition. Please note that pretty much every single part on this car has been either replaced or put in to like new or better condition. It comes with a thick binder of detailed explanation of all the work done. Also, a CD with pictures during the restoration. 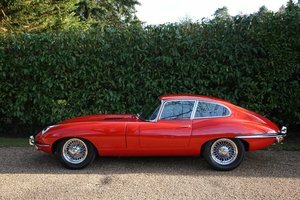 If you are looking for one of the very best Jaguar E-type coupes on the market you will not be disappointed with this car. We are located in south Sweden just outside Malmö and would be happy to pick you up from Copenhagen airport (Denmark) that is very close. The ferry to Germany is only 20 minuits away from us. 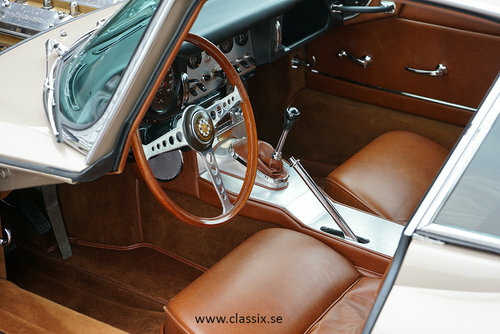 Please visit our homepage http://www.classix.se to see all the high resolution pictures we have on each car. We always have between 20-30 cars in stock. Dieses Auto befindet sich im Sueden von Schweden, nur 30 Minuten vom Flughafen Kopenhagen entfernt. Wenn Sie Interesse haben sich das Fahrzeug anzuschauen, können wir Sie auch gerne vom Flughafen abholen. Wenn Sie das Auto kaufen möchten, können Sie es nach Hause fahren oder wir könnten auch einen Transport fuer Sie organisieren. Ich spreche gerne Deutsch am telefon, und antworten e-mail nur im Englisch. 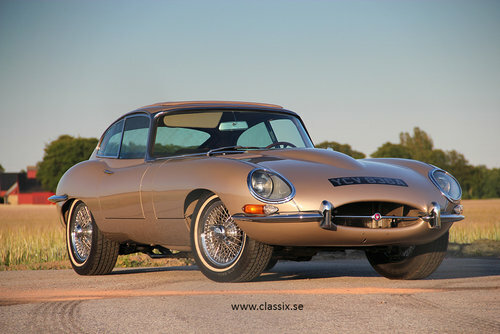 If you vivist our website http://www.classix.se you will see more of this car and all the other cars we have for sale.